The problem is that your skin is not just depigemeted, I think that your white areas are actually scars. That is much harder to improve. Try the approach I suggested in my previous posting. Even if dermarolling/needling improves your scars only temporarily and you will have to do regular rolling maintenance to keep it pigmented, at least you will have a way to make your décolleté looking nice for when you needed and you will be able to wear low cut neckline dresses etc. Spironolactone has been used orally as an anti-androgen in gyneacology and other fields for a long time so it is certainly a genuine approach to hair loss. Topical application of spironolactone will have less side effects but I cannot comment on how effective the topical application is. It is certainly worth trying, just like Finasteride. Male pattern baldness is hormonally induced and you will hardly win the battle against hair loss without targeting the hormonal aspect of it. Dermarolling cannot affect hormones. It can enhance the penetration of hair loss products and it will increase blood flow to the hair follicles. Thank you for posting the link. It shows that dermaneedling works! I have seen that photo before and I also though the improvement was amazing. Dermarolling often works wonders for acne scars and post acne spots but unfortunately it very seldom works for enlarged pores. Pores are not scars. Dermarolling / Microneedling / Newbie with HORRIBLE SKIN DETERIORATING! Lines, dents, pricking, porous pink skin and orange peel texture. What did the dermatologists say? Dermarolling / Microneedling / Thin skin on chest along with scars, need a plan of action. 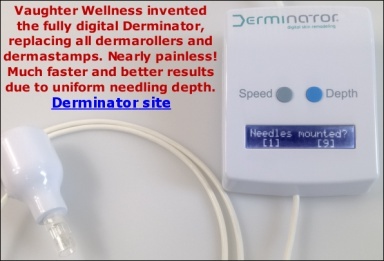 I recommend you a regular 1 mm dermaroller. Roll your entire chest densely every ten days. It should improve the scars. I am not sure it will make any difference concerning the visible veins because dermarolling thickens the skin on average by about 0.2 mm. That is enough to make a difference in scars and wrinkles but do not think it is enough to "hide" visible veins. In any case, to increase the thickness, you have to dermaroll long-term. You should start rolling your whole chest three times a week with a 0.5 mm dermaroller. In addition, use a 1.5 mm dermstamp on the scars and on the spots that are the most de-pigmented. Stamp the spots and slightly outside of the borders of the spots to facilitate migration of melanin pigment from the surrounding normal skin into the de-pigmented spots. If your depigmentation improves, some dermarolling maintenance may be necessary to keep it. Dermarolling / Microneedling / What to use while breastfeeding? Not using a strong anti-inflammatory substance applies only immediately after dermarolling with long needles. Some hours later, it is already OK. I am not sure how strong anti-inflammatory Tamanu oil is but you can for example apply almond oil. Almond oil does not have a strong anti-inflammatory effect. Dermarolling / Microneedling / Sunscreen after rolling? Infadolan contains oil-soluble vitamins (A and D) and oils do not prevent their penetration so you do not have to worry about it. Zinc oxide is an excellent sun-block, even though I recall recently a study that foundt it can split off chemicals that can cause skin cancer, when irradiated by UV. It deflects most of the UV. Unfortunately, zinc oxide dehydrates the skin. Zinc oxide is a mild astringent. An astringent is a substance that constricts body tissues. After dermarolling though, the "open" skin should be kept as moisturized as possible and that's why substances with astringent and dessicating (drying) properties are not suitable. Especially after rolling with long needles. If you can avoid it, do not apply it right after dermarolling. Wait at least overnight and moisturize the skin first. Tamanu oil has anti-inflammatory properties but I am not sure how strong anti-inflammatory it is. Most oils have certain level of anti-inflammatory effect. Not applying a strong anti-inflammatory substance applies only immediately after dermarolling with long needles. Some hours later, it is already OK. The photo is slightly (20 to 40% enlarged) so the pores a bit less visible in reality. Certainly, do not needle all of them in one go. You can try to needle one, to see how it reacts because pores are unpredictable. Needling improves scars, however pores are not scars. They are ducts in the skin and that is a different issue. I think you should concentrate on your scars because it is very probable they will improve with dermarolling/stamping and the suction. You look very handsome even with the scars though! Hi Birdsing, I will answer you but your case is very complex and I need more time to think about it. I have looked at your photos and in many of them it looks like you have actually nice skin and the only problem is the redness, brown spots/dots and the bumps. Your pores do not seem to be enlarged. In some of the photos, there are some strange indentations (not in the pores) - these photos are quite enlarged so I am not sure how visible the indentations really are. Dermarolling / Microneedling / Sarah, Dermastamp Advice Please? The PM function is diabled, to prevent that spammers sign up and spam all members here. If you have a question for me, you can either post it here or email me.